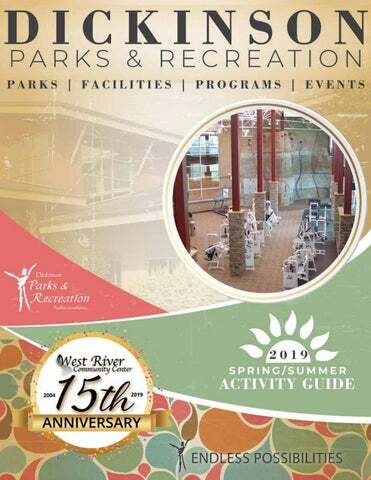 WELCOME Dickinson Parks and Recreation is proud to release our 2019 Spring/Summer Activity Guide. Our tremendous staff has put together an awesome array of programs, events and classes for people of all ages. Please read through this guide as I am sure you will find something that grabs your attention; from a beautiful park, a new leisure trail, a wonderful facility or a program offered by Dickinson Parks and Recreation or one of our many partner groups. OUR MISSION Dickinson Parks and Recreation’s mission is to enhance the quality of life for the community and its visitors by providing leisure opportunities. 3753 114TH AVE SW | 701.456.2056 HOME OF LIONS PARK AND THE CROOKED CRANE TRAIL. SEASONAL PRIMITIVE AND MODERN CAMPING AVAILABLE. SEE FUN SEE WHAT YOUR KIDS ARE UP TO! FOLLOW US TODAY! All of our programs require preparation to provide the best possible experience. Please help us by registering prior to program deadlines. No on-site registration will be taken, unless specified. For your convenience, visit dickinsonparks.org to register online. No transaction fees apply. We are happy to assist you in person at the DPR Administrative office, 2004 Fairway Street. Payment is due at the time of registration. We accept cash, checks, gift cards and credit cards (Mastercard, Visa and Discover). Refunds are allowed prior to the first day of the program. No refunds are given for programs with limited enrollment (unless spot is filled by wait-list or for cancellation after a program begins). Please watch for registration deadlines specific to each program. 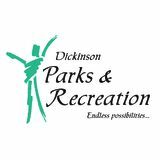 Dickinson Parks & Recreation is committed to providing equal access for all participants. All programs are open to individuals with disabilities. If special requirements are needed due to a disability, please include a written request with registration form. Give the gift of Parks & Recreation! Gift cards are available for use of all of our programs and facilities. Purchase one today at Dickinson Parks and Recreation, Heart River Golf Course or West River Community Center. Dickinson Parks and Recreation frequently photographs and videos participants enjoying our programs, events, parks and facilities. These photos/videos are used for parks and recreation. GET TO KNOW OUR FACILITIES! 240 2ND ST SE This facility is home to Dickinson Baseball Club and the Badlands Big Sticks (summer collegiate wood bat league). Within the ballpark are the Astoria Field and Coke Field. Astoria Field offers turf infield, newly renovated stadium seating and team dugouts. 455 8TH AVE SW The dog park, located next to Gress Softball Complex was created through a partnership with Oreo’s Animal Rescue to provide an area to let your pets run around leash-free and interact with other dogs. The park provides a large fenced in play area for dogs 30 lbs. or more along with a separate play area for small dogs. Water and sanitation stations are available. Jaycee Park Disc Golf Course – 497 2nd St SE – 9 hole course located along the Heart River in south Dickinson for recreational and youth play. Memorial Park Disc Golf Course – 801 5th Ave W – 12 hole course with multiple pins and dual tees. Fairly open course with good elevation. Patterson Lake Disc Golf Course – 3753 114th Ave SW – 18 hole course includes a diverse professional course next to Patterson Lake. Wide variety from very long and open to short and very tight play. 455 8TH AVE SW This adult softball complex is situated on 23 acres of land running alongside the Heart River. Within the complex are 6 softball diamonds with bleacher seating; complex office, concessions and restrooms; small playground; 2 picnic shelters and a nature trail leading to Eagles Park. 2475 BROADWAY W This self-serve rental facility offers a scenic view of Heart River Golf Course and is located next to Turtle Park and Dickinson Dike. The venue is a great space for a variety of gatherings with a capacity of 125 people. 2004 FAIRWAY ST This baseball complex is home to the Mustang Baseball Club. The complex features 3 fully lighted fields with natural grass infields, covered dugouts, concessions, restrooms, picnic shelter, playground and batting cages. The complex is surrounded by Leisure Park Trail and located next to West River Community Center and West River Ice Center. DICKINSON DIKE 2302 Broadway W Located next to Turtle Park and Heart River Retreat. The dike is 19 acres and approximately 20 feet at its deepest point where anglers can expect to catch a variety of fish including rainbow trout, cutthroat trout, catfish, largemouth bass and small bluegill. 1600 FAIRWAY ST Softball complex home to Dickinson Diamonds Girls Fast-pitch Softball and Dickinson State University Women’s Softball. The complex features 4 fast pitch diamonds with enclosed dugouts and 20’ backstops, outfield fences of 200’ down the foul lines and 225’ to center field, batting cages and bullpen mounds as well as concessions and restrooms. 2015 EMPIRE RD The skate park is located on the west side of the West River Community Center. The wide variety of skate features are constructed of concrete and accommodate skaters of all skill levels. 2015 EMPIRE RD The soccer complex features 6 youth soccer fields for a combined acreage of 6 acres. The fields are located west of the West River Community Center and across from West River Ice Center. It is situated within Leisure Park which contains a 2 story outdoor playground and 1.1 mile walking trail. GET TO KNOW OUR NEW GOLF PROFESSIONAL “I am excited to start at Heart River Golf Course. My main goal is to help Heart River be a place where you wish to be by providing a warm professional atmosphere, a friendly staff, merchandise that fits the community, quality golf instruction, well run events and an orderly golf experience. I enjoy teaching and playing golf with players of ALL ages and abilities so hopefully I’ll get to meet and play with everyone. The Heart River Golf Course is a challenging 18-hole, par 72 layout that is nestled along the scenic Heart River, with numerous panoramic views of Patterson Lake. Heart River Golf Course is home to several premier golf tournaments, including the gem of them all, the Kevin Bergman Labor Day Classic. We will also try to accommodate your special golf outing or tournament request. Season passes can be purchased at Dickinson Parks & Recreation or the HRGC Pro Shop. RESTAURANT | Hours will vary within the golf season. Green 19 is a full-service grill and bar located at Heart River Golf Course. Offering everything from soups, salads, and burgers to tap beers, liquor, and wine. Our menu consists of hand-pattied burgers with our house seasoning, salads, wraps, appetizers, and a variety of panini sandwiches. We also have candy, snacks, and daily specials for the golfer on-the-go. Come play Heart River and check us out! PRO SHOP The Pro Shop sells a large variety of golf equipment and apparel featuring top brands such as Callaway, Titleist, Ping, Under Armour, and many more. Whatever you’re looking for, if we don’t have it in stock we will order for you. Gift cards are also available . HOURS & ACTIVITIES Heart River Golf Course hours are 9:00 am to sunset once course opens. The opening hour will change to 6:00 am from Memorial Day - Labor Day . MEN’S GOLF DAY Tee times scheduled to run approximately 9:00 am to 5:00 pm on Tuesdays. There will be a Net and Gross Skins Game every week. Sign up required at the Pro Shop. WOMEN’S GOLF DAY The Women’s Golf Association tees off every Wednesday at 8:00 am, sign-in at 7:45 am. This group plays a variety of different games and has a lot of fun. Begins the first Wednesday in June. 2019 SEASON PASSES Family***........................................................... $1,155.00 Married Couple .................................................... $966.00 Senior Married Couple (60+) .................................... $924.00 Single (24-59) .. ...................................................... $514.50 Senior Single (60+) ............................................... $493.50 Intermediate (19-23) ............................................ $383.25 Junior (12-18) . . ...................................................... $220.50 Pee Wee* (11 & under) .. ....................................... $110.25 Fall Pass (eff. 8/13/19) .. ........................................ $194.25 Handicap Fee . . ........................................................ $30.00 *Pee Wee - 11 & under must golf with an adult. **Twilight fee begins four hours prior to sunset. ***Family - Married couple or an adult and any dependent up to age 24. PATTERSON LAKE RECREATIONAL AREA Patterson Lake Recreation Area consists of 26 miles of shoreline, 1,438 acres of land and 819 acres of water. The land is owned by the United States Bureau of Reclamation and managed by Dickinson Parks and Recreation. It is home to Lions Park and the Crooked Crane Trail. It also features one of the top disc golf courses in the country. CAMPING RESERVATIONS ONLINE : dickinsonparks.org CALL: (701) 456-2056 or (701) 456-2074 Season: Labor Day weekend to Memorial Day weekend MODERN & PRIMITIVE CAMPGROUND: Amenities: Access to bathrooms/shower house and a sewer dump station. Each modern site has electricity and water. The 1.8 mile double loop is a concrete 10 ft. wide path with exercise and play equipment for all ages. This state of the art trail is the first of three phases to complete a trail around Patterson Lake. West Trail:	1.1 miles East Trail:	0.7 miles Entire Loop Trail:	1.8 miles Fitness Pods are located throughout the trail. EAGLES PARK | 428 2ND AVE SW Walk this scenic .80 mile trail by the riverside to Gress Softball Complex. LEISURE PARK | 2015 EMPIRE ROAD 1.1 mile loop around the West River Ice Center and West River Community Center. Accommodations include benches located along the trail with many trees along the way. The trail also has great access to the Mustang Baseball Complex, West River Ice Center and West River Community Center. ROCKY BUTTE PARK | 566 FAIRWAY STREET Scenic .80 mile loop around Rocky Butte Park. BANDSHELL The Bandshell is used throughout the summer for area concerts and special events. HEART RIVER RETREAT Located next to West River Community Center this facility contains two sheets of ice. During on-ice season, August-March ice rentals may be made for school / group events, private rentals, birthday parties, etc. A private party room (49 occupancy) is available. During the off-ice season (March-September), rentals may be made for business & vendor shows, club events, public events, etc. The main facility consists of a large 2nd floor viewing area. The main arena floor area measures 216 ft. x 137 ft. with seating for 1,228. Floor space in the 2nd arena measures 216 ft. x 85 ft. with seating for 300. Rental rates are available daily or hourly with discounts for multiple day usage. PARK SHELTERS Plan your family reunion or company picnic at one of our shelters! WATCH FOR PUBLIC SKATE COMING BACK IN THE FALL! The West River Community Center is a 135,000 square foot center built with plenty of modern amenities and a “western edge” design that blends with the landscape of southwestern North Dakota. The program areas are designed to achieve not only a visual connection between spaces, but an openness that allows users to feel a sense of community. The facility maximizes the use of natural light by way of large windows. Designed with the philosophy that community recreation centers should entertain, educate and promote health and well-being. SilverSneakers and Silver & Fit programs offer eligible members no-cost or low cost fitness memberships. If your health plan offers SilverSneakers or Silver & Fit, please call the DPR office at 701-456-2074. WRCC OUTDOOR POOL WHEN THE WEATHER TURNS WARM, ESCAPE TO THE WRCC OUTDOOR POOL WHERE THERE IS SOMETHING FOR EVERYONE ! JUNE 1 - AUGUST 18, 2019 HOURS OF OPERATION: June 1 – August 18 Mon-Sun 12:00 – 7:00 PM Scheduled safety breaks occur every 50 min. The Outdoor Pool is included in all WRCC memberships and daily fees. AMENITIES 3 WATER SLIDES LAZY RIVER WATER SPRAYS, JETS AND WATER FALLS ZERO DEPTH INFANT WADING POOL CONCESSIONS COVERED UMBRELLA PICNIC AREAS MEN’S & WOMEN’S LOCKER ROOMS FAMILY CHANGING ROOM GREEN SPACE Text WATERPARK to 84483 to receive WRCC Outdoor Pool notifications. PERSONAL TRAINING GET IN SHAPE & FEEL GOOD Whether you’re trying to maintain your overall health and fitness, training for a marathon, or anything in between. We have the expertise to help you on your journey, motivate you, keep you accountable, and help you conquer your goals. All classes are included in your WRCC membership or available for a daily fee. WRCC offers a wide variety of land and aqua group fitness classes for ages 14+ . All instructors are certified and all classes may be modified based on your fitness level. For more info on group fitness, please pick up a current group fitness schedule from the WRCC media rack or visit our website. TEXT ALERTS Get instant updates on group fitness classes, text WRCCGFIT to 84483. TRX YOGA ZUMBA AND MORE! VISIT WESTRIVERCOMMUNITYCENTER.COM FOR A FULL GROUP FITNESS SCHEDULE. STROLLER BOOTCAMP 6 WEEK PROGRAM! DAYS:	Mon & Thur SESSION:	June 3-July 18 (no classes July 1 & July 4) TIME:	8:30-9:30AM LOCATION:	Leisure Park | 2015 Empire Rd FEE:	$60.00 DESCRIPTION:	Stroller Bootcamp will be led by ISSA Certified Personal Trainer & Group Fitness Instructor, Krystal Boggs. Stroller Bootcamp will be held 2 times a week for 6 weeks. It will take place outside (weather permitting), and incorporate different cardio & strength exercises. Strollers, dumbbells, mats, & other equipment will be used to achieve the most beneficial workout for the participant. PI C N I C S H E LT E R R E S E R VAT I O N S Groups planning picnics can reserve Lions Park, Eagles Park, Jaycee Park, Turtle Park, Rocky Bu�e Park, Gress So�ball Complex, or the old Archery Range by calling Dickinson Parks & Recrea�on at 456-2074. Shelter reserva�ons may not be made more than 365 days in advance. A nonrefundable fee of $45.00 per shelter is required for all parks except Eagles Park and Lions Park, which requires a nonrefundable fee of $50.00 per shelter. Payment must be made at �me of reserva�on. This may be done during regular oﬃce hours of 8:00 am to 5:00 pm, Monday through Friday. Picnic bags (containing a volleyball, football, soccer ball, play ball, so�ball bat, 2 so�balls and 2 frisbees) are available for a rental fee of $5.00 per bag. Horseshoes and wind screens are also available upon request where applicable. Bathrooms All bathrooms are seasonal. ***SPECIAL NOTE*** The following bathrooms are only accessible through picnic shelter reservation: Eagles Park, Jaycee Park, Turtle Park, Rocky Butte Park and Gress Softball. A key will be provided one business day prior to the reservation date. SWIM LESSONS LEVELS/AGES:	Pre-A | 3 yrs. - 5.99 yrs. Pre-B | 3 yrs. - 5.99 yrs. Pre-C | 3 yrs. - 5.99 yrs. Level 1 | 6 yrs. - 8.99 yrs. Level 2 | 6 yrs. - 13.99 yrs. Level 3 | 7 yrs. - 13.99 yrs. Level 4 | 8 yrs. - 13.99 yrs. Level 5 | 8 yrs. - 13.99 yrs. DESCRIPTION: These classes are designed to encourage parent/child learning and water adjustment in a safe and positive setting. Parents accompany their children at all times while an experienced instructor guides parents in teaching their children fundamental safety and aquatic skills. Parent/child classes are excellent opportunities for children to begin transitioning to the preschool swim program (see parent & me class description on pg 21). FLIP T H E PA G E TO S IS RIG EE WH H T FO R A YO U R K T L E V E L IDS! AQUATICS - SKILLS CHART SWIMMING AND WATER SAFETY SKILLS CHART Parent and Me Aquatics Builds basic water safety skills for both parents and children, helping infants and young children ages 6 months to about 3 years become comfortable in the water so they are willing and ready to learn to swim. These basic skills include adjusting to the water environment, showing comfort while maintaining a front or back position in the water and demonstrating breath control, including blowing bubbles or voluntarily submerging under water. Throughout all levels, children are led through a progressive, multiphase program in learning the building blocks of swimming. Class placement in this program is based on your child’s water skills. Skill evaluations are conducted on the first day of class to ensure that your child is in the appropriate program level. If you are not certain of your child’s ability, you may contact the Aquatic Supervisor to discuss your child’s skills. PRESCHOOL CLASSES are not a prerequisite to Level 1. Preschool classes are meant to get children comfortable in the water and emphasize water safety. If your child is 6 or older and has not had lessons before, they should start with Level 1. The American Red Cross offers a comprehensive, developmentally appropriate swimming and water safety program that teaches you, your child or other family members how to swim skillfully and safely, and think and act safely in, on and around the water. The prerequisite for each level is the successful demonstration of skills from the preceding level, except for Level 1, which has no prerequisites. in our youth art classes. There will be a total of four 2 week sessions available for sign up, each with unique goals and projects. DESCRIPTION: Come and get messy and leave us to the clean-up! Children will be using different craft supplies to make themed crafts. They will have the chance to increase their sensory and fine motor skills through making their creations. Children must be accompanied by an adult. 9:00 AM-10:15 AM 6-8 YRS. 10:30 AM-11:45 AM 9-12 YRS. 9:00 AM-10:15 AM 9-12 YRS. 10:30 AM-11:45 AM 6-8 YRS. DESCRIPTION: Classes are for anyone age 16+, who wants to become a certified belayer. Being certified allows you to climb the wall during open climb hours. DESCRIPTION: Children will have the opportunity to be outdoors. Our staff will have creative and fun weekly themes that will encourage free play and will also Include games and simple crafts. Children must be supervised by an adult. equipment without parental supervision after successful completion of this class. This year’s theme for Park and Recreation Month is Game On! So, start lacing up your fun shoes and get ready to get in the game this July. 9:00 – 10:00 AM 7-11 YRS. 10:30 AM – 12:00 PM 12-15 YRS. be conducting junior lessons. Instruction will involve short game, driving range, and golf course etiquette. PLAY PARK IS FUNDED IN PART BY THE OPTIMIST CLUB OF DICKINSON. 4:00 – 4:55 PM | 6 YRS. 5:05 – 6:00 PM | 5 YRS. FEE:	$32.00 DESCRIPTION: T-Ball is an introductory (coed) program to the game of baseball at its most basic level. Players will be introduced to the basic skills of throwing, catching, hitting, and running the bases. Participants will hit off the batting tee for entire program. 9:30 – 10:25 AM | 9-11 YRS. 10:35 – 11:30 AM | 6-8 YRS. in need of one during lessons. as well as farm and water. Special guests will make appearances each day to implement the safety of things around us. Students will practice riding bikes and crossing streets in a miniature city setting. LOCATION:	TBD DESCRIPTION: Competitive ½ court league play in a recreational setting! Participation in this program is a great way to jump start refining your basketball skills for the full court winter season. teams will compete against each other in the same game. Playing rotation: Team #1 Batting – Team #2 in Outfield + Pitcher – Team #3 in Infield + catcher. NIGHT OF PLAY:	Thurs. & Sun. All entry fees must accompany completed registration forms by the program deadline. DESCRIPTION: Competitive league play in a recreational setting! Participation in this league is a great way to enjoy some outdoor interaction with your peers on a beautiful summer evening. NEW Pole System – Keeps Nets Tight! DESCRIPTION: Competitive league play in a recreational setting! BUMP up your energy level with participation in the sport of volleyball. DESCRIPTION: Welcoming all SilverSneakers members and friends to this social event! Enjoy good conversation, food, refreshments and prizes. Please bring a dish to pass. Learn about other upcoming health and wellness opportunities offered at the West River Community Center. DONâ&#x20AC;&#x2122;T MISS NOURISHING GENERATIONS COMING BACK IN THE FALL! and 3rd place. NOTE: Silver Sneakers Pot Luck, Tuesday, May 21 will be the kick off to the Silver Sneaker 100 Mile Walking Challenge. Please bring a dish to pass. Learn about upcoming health and wellness opportunities. In honor of Flag Day, BSA Troop 32 will be conducting a public flag retirement ceremony beginning at 6:30 -7:00p.m. This ceremony honors the American flag by properly disposing of a flag which is no longer fit for use. All are invited to join in publicly honoring the American flag, and in turn, all those who have served under it. The Troop will be collecting flags in need of retirement. These will be retired at a future event in cooperation with the American Legion. Inclement Weather The West River Ice Center, 1865 Empire Rd will be our backup location. COME JOIN US FOR SOME FUN 2004 FAIRWAY ST THE BASEBALL TEAM WILL BE TAKING PICTURES WITH FANS, SIGNING AUTOGRAPHS, AND SWIMMING ALL AFTERNOON. WE WILL HAVE DOOR PRIZES FOR SOME GAME TICKETS AND MEMORABILIA, ALONG WITH ICE CREAM AND OTHER ACTIVITIES! get ready...set..create! We will provide the chalk, and you provide the inspiration! Special entertainment, artists and local vendors will be at the Bandshell during the event. We look forward to seeing you there! Art Advocates Squares of sidewalk are available for art students that are interested in creating pieces of art in different locations throughout the park area for the public to view during the event. Art teachers and professors can contact our office to let us know how many students will be participating in order for squares to be reserved for the event. Artists are welcome to create their pieces prior to the event time. Collaborative chalk Competition Squares of sidewalk are also available to purchase for $50.00 as part of our businessesâ&#x20AC;&#x2122; competition to create a piece of art as a team. STATE BASEBALL TOURNAMENT DATE:	July 11-14, 2019 TIME:	Check tournament brackets listed at dickinsonparks.org LOCATION:	Mustang Baseball Complex | 2004 Fairway St DESCRIPTION:	The winner of this tournament will advance on to the 9 Yr. Old Cal Ripken Midwest Plains Regional Tournament July 17-21 in Frontenac, KS. 10 YR. OLD CAL RIPKEN MIDWEST PLAINS REGIONAL BASEBALL TOURNAMENT DATE:	July 17-21, 2019 TIME:	Check tournament brackets listed on dickinsonparks.org LOCATION:	Mustang Baseball Complex|2004 Fairway St DESCRIPTION:	This tournament’s participants consist of the Dickinson Host Team and state champions of ND, MN, KS, CO, MO & NE. The winner of this tournament will advance on to the 10 Yr. Old Cal Ripken World Series Tournament August 1-8 in Phenix City, AL. Registration: Forms can be found on the Dickinson HS and Dickinson Middle School Web Pages. Registration forms will be handed out to DPS Elementary Schools in April. Forms can be mailed to Dickinson High School Attn: James Hayden 979 13th Ave. West Dickinson, ND 58601 Questions: Contact Coach Brent Wolf at 701-590-0068, bwolf@dpsnd.org Coach James Hayden at 701-456-0030, jhayden@dpsnd.org. sport of football; teach them the skills and fundamentals to play the game and teach sportmanship. 5th - 6th grade tackle football league focuses on teaching the fundamentals of the game and gives a solid foundation to tackle football. Games are played Saturday mornings at the DHS practice ďŹ eld. Check out our website and Facebook page for information on registration. R e g i s t e r O n l i n e T o d a y ! Kids Race The events all finish at Gress Softball Complex. The Half Marathon, Half Marathon Relay and 13 Mile Bike Race start off 116th on the Crooked Crane Trail. Anglers. Prizes and awards will be given out and a free lunch will be served. Tiny Tots Beg. & Int. 1 lesson per week ……………$84.00 ……………….$96.00 2 lessons per week …………$160.00 ………………$182.00 3 lessons per week …………$236.00 ………………$270.00 $20.00 Annual Family Membership Family Rates: 1st child regular fee. Each additional child 10% oﬀ. Registration: Class size will be capped this year to ensure quality instruction. Registration closes May 17th. Register forms available by contacting us. There will be a uniform sizing and pickup at the DHS Wrestling Room Thursday, May 30th from 7:00-8:30pm. Dates: May 30th-June 27th 2019 Days: Regular Class: Tuesday and Thursday Evenings Advanced Class: Monday Evening Time: 7:00-8:30 pm Ages: 5 to adult Fees: $20.00/person plus uniform required Location: DHS Wrestling Room *Gentle Ways Inc. is a non-proﬁt organization. All instructors are volunteers. DICKINSON HOCKEY CLUB Come out and play the Coolest & fastest Team sport in the world! Hockey Mini season for players born 2013 & younger will start October 1, 2019 and all other age levels will start on October 21, 2019. We will be kicking off our Summer Reading Program with a Bouncy castle, games, photo booth, music, and much more! Free and open to all ages, zero - adult! Sign-up at the library main level circulation Desk. Win prizes for reading! And participate in summer reading program events! We are looking to hire experienced coaches for the 2019/20 Season!!! Long Course Swim Season: May 20th to July 26th If you enjoy swimming and want to learn new skills and build endurance come check us out during Splash Week! During Splash Week youth swim for FREE and swimming skills will be evaluated to ensure the swimmer is able to complete swim team workouts through Long Course Swim Season. It’s FUN to go off the Deep End with the Dolphins! Email: dickinsondolphinswim@gmail.com Website: www.dickinsondolphins.com Find us on Facebook too!! West River Ice Center - West Door 1865 Empire Road, Dickinson, ND Registration: 7:30 - 8:30 am Cost: $20 per participant Kids Face Painting and Fun Run 8:30 am 5K/10K run 9:00 am | 5K walk 9:00 am/wacky hair 100 Silent Auction Items - Open to the Public! A super fun two-week experience! Everyone is welcome! Where: Dickinson Middle School Time: Weekdays 8:30AM - 3:00PM Cost: Only $200 for the two-weeks! Where: Dickinson Middle School Time: Nightly 6:00PM - 9:45PM Cost: Only $100 for the two-weeks! A unique experience in all things Ukrainian! Music. Art. Language. And of course...Ukrainian Dance! When all is said and done, Campers get to costume up, take stage, and show off their best Ukrainian moves at the North Dakota Ukrainian Festival! All experience levels welcome! The NDUDA Summer Ukrainian Dance Workshop is an extraordinary dance immersion featuring fun, folk, and friendships that last a lifetime. Then it’s time to take stage and perform at the North Dakota Ukrainian Festival! Strong Families Today & Tomorrow Parenting young or not-so-young children and coping with the day-to-day struggles family life can bring, our programs may help! Imagine...kids who are fun to be around Imagine...kids who listen the first time Imagine...no more arguing. Reasons to stop by the Parent Center: 1. You want to put the FUN back into parenting 2. You want happy kids that make positive choices 3. Provide effective tools for difficult behavior. Safety City—Encouraging child’s problem-solving skills; reduce challenging behaviors, get more cooperation and parent through meltdowns. OUTSIDE GROUPS DICKINSON PARKS AND RECREATION OFTEN TAKES PHOTOS AND VIDEOS OF OUR PARTICIPANTS, ENJOYING PROGRAMS, EVENTS, PARKS, AND FACILITIES. THESE PHOTOS/VIDEOS ARE USED BY DPR FOR PROMOTIONAL PURPOSES. BUILDING A BETTER COMMUNITY ONE SMILE AT A TIME. By sponsoring and supporting our programs, events and tournaments you will enhance the quality of life in the Dickinson community. Partner with Dickinson Parks & Recreation to market your business or organization in active community locations. Recognition will be given to our sponsors in numerous ways depending on the activity or the function. Our programs are a fun way to stay active and healthy for all ages. Programs are designed to educate the community in health, wellness and encourage active play. Our events are a great way to bring communities together and promote a healthy family lifestyle. Our tournaments are a great way to bring Dickinson together through competition. THANK YOU DICKINSON PARKS AND RECREATION IS VERY THANKFUL FOR THE SUPPORT OUR COMMUNITY PROVIDES US THROUGH SPONSORSHIPS AND DONATIONS.